An intense tang leads to masking of the great complexity that this tart and well layered sauce possesses. A quick read of the bottle gives you a bit of insight into its backstory. 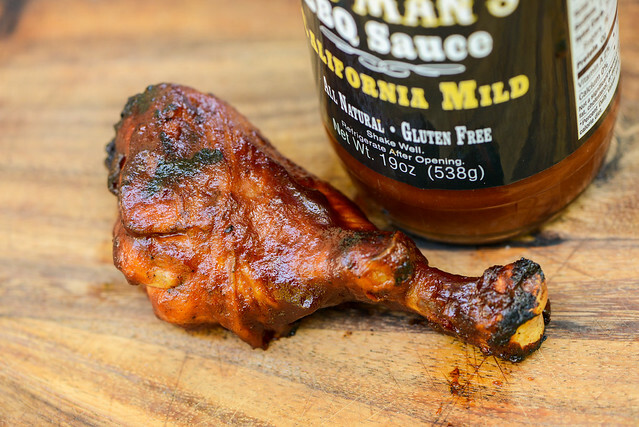 First, it's coined Deaf Man'sBBQ because it's creator, Rasool Raheem, is indeed deaf. 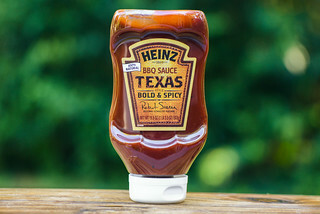 The company name comes along with the slogan, "You'll Never Hear of a Better BBQ Sauce," which starts to clue you into Rasool's personality and humor. The "bbq" portion comes from Rasool's family history, which is steeped in barbecue tradition dating back generations. Lastly, the "California Mild" label represents Rasool's current hometown of Los Angeles and its own unique influences on his sauce and cooking. Rasool's line of sauces current comes in four distinct varieties and are available online. A very deep, acidic tomato dominates the aroma of this sauce. It's heavily tart and only lightly sweet, giving it a tomato paste-like quality. Behind the tomato is a distinct mustard component, which goes to further the acidity and increase complexity. Beyond that, there's an equal mix of garlic and onion that adds depth to the overall aroma. This rusty red red sauce is opaque, making difficult to see any spices save for a few stray specs of black pepper. It has a slight texture to it and a semi-matte sheen. It rests right in the middle of the thickness scale and falls in a couple large globs at first off of a suspended spoon, then switches to a quick, somewhat uneven pour. After slowing and releasing a few final drips, a medium coating of sauce is left clinging to the silverware. Taste followed smell—the sauce had a heavily acidic tomato start. It wasn't quite as strong as I anticipated though thanks to a mellow sweetness that helped balance the tartness. That beneficial mixture was short lived though and the sauce increased in acidity quickly as it settled on the tongue. Along with that amped up tang came a mustard-y bite and notes of onion and garlic. Then the sugar made another play as the sauce started to taste more balanced again. 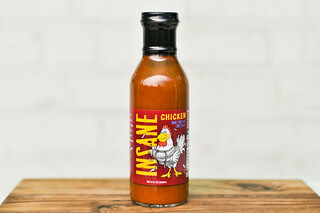 It's at this time that a smoky, earthy heat came into play, which built up to a mild burn as the vinegar took another shot right at the end, leaving a lingering tangy heat when all was said and done. The sauce coated the chicken in an medium, even layer that baked down well over indirect heat. There was minimal burn off over direct heat along with decent caramelization without burning. The flavor still tilted heavily to acidic. It retained its deep deep tomato base, but the balance between tart and sweet didn't improve except for in the caramelized bits, where the increased sweetness was particularly good. All-in-all, I would rank this as a fairly average sauce. It had a nice complexity with an interesting progression of flavors. 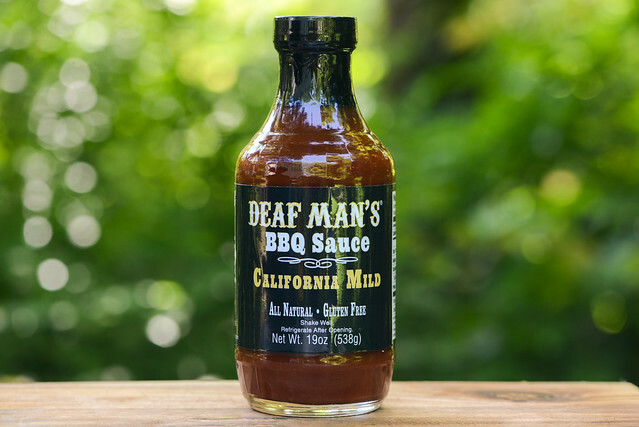 Usually that's what I look for in a great barbecue sauce, but Deaf Man's California Mild just hit the acid too hard for my tastes, and since vinegar is such a dominating ingredient, it kept the sauce from having a better sweet and tart balance that would allow all the layers of flavors to come out more. Still, there's something to be said for a sauce the remains tart after being cooked—most veer to sweet in that scenario. 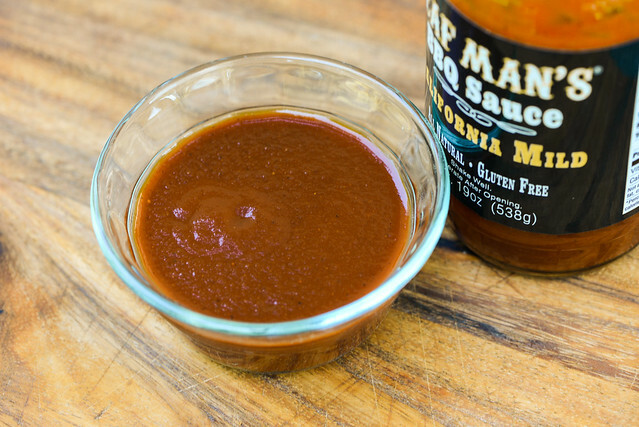 It leaves me thinking it would pair great with a sugary rub, where that ideal mixture of sweet and tangy could take hold and deliver on the full potential of this sauce. Who doesn't love free sauce? Rasool knew you Meatwavers especially like it and sent along a second bottle for the winner of this giveaway to try out themselves. 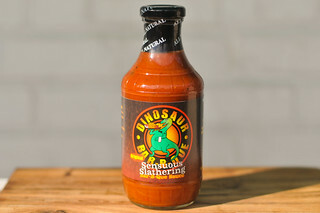 If you'd like to be entered to win this bottle of sauce, all you have to do is comment on this post with oddest thing you've ever grilled or smoked. Deadline for entries is 11:59pm on Tuesday May 24, 2016. Read the official rules for more details. One entry only per individual. Good luck! This is hard. Everything I grill or smoke is pretty conventional, at least I think it is. I smoked an apple pie once. Like Gus, it's usually pretty conventional for me as well. Smoked eggs. Best deviled eggs ever. I've put potatoes in the smoker. Turned out tasty. Sea robin. Wasn't that bad!